After finally checking into our hostel in Palermo, Bryanna and I indulged in a meal at a nearby restaurant. I think my excitement over being in Italy and my exhaustion from the journey made me forget my usual obsession with spending as little money as possible. I spent eleven euros on a pizza and a beer, including five euros just for the beer. Afterwards, I was disgusted with myself. Five euros for a beer? I could have bought three meals of street food for that. I restored my miser cred at the grocery store after the meal, buying the usual cheap backpacker staples: baguettes, bananas, carrots, cheese, and cans of tuna. As I mentioned in my last post, our hostel, the Youth Hostel Baia del Corallo, was far from Palermo’s center, in the much less hectic Sferracavallo neighborhood on the shore of the Mediterranean. Although I didn’t like having to take an hour-long bus ride to get to the city (or longer, depending on how long it took for the buses to come), Sferracavallo had a lot to offer, with a good selection of stores and restaurants, and a nice boardwalk. The hostel itself was right on the shore, with an excellent view of the bay. I’m glad I met Bryanna on the train, because there weren’t many other people in the hostel to hang out with. My roommate was a Spanish fellow who wasn’t very talkative. Bryanna had her room to herself most of the time. I just gave the hostel a good review on hostelworld.com. They didn’t make me pay for the first night’s reservation I missed, even though they could have according to the contract. However, the breakfast they offered was horrible – a fluffy little croissant, some crackers, a tiny bit of jelly, and coffee. It was obvious they wanted to be able to advertise that they provided breakfast, then they did it as cheaply as possible. 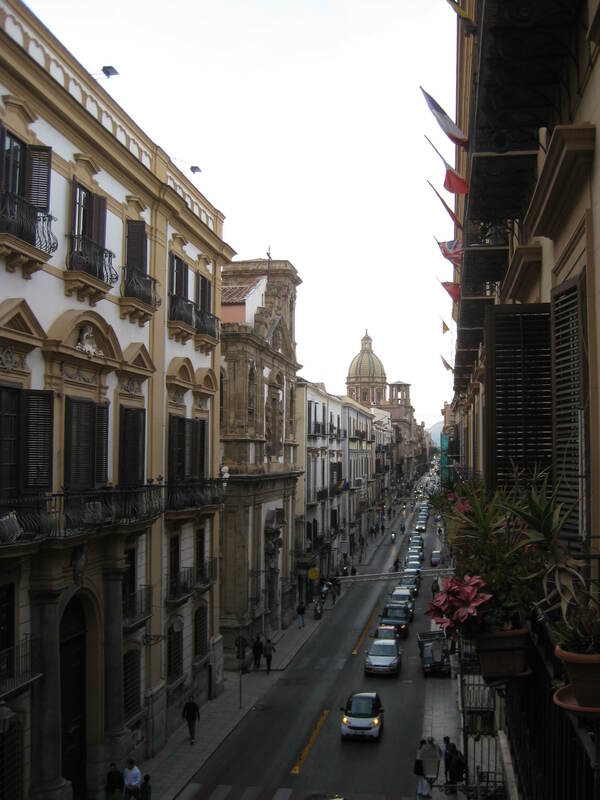 A street in downtown Palermo. After getting settled and getting a good night’s rest, I finally had the presence of mind to make some observations about Italy. My first thought was that Italy has the highest density of charm in the world. In my post about Athens, I remarked that nearly all the buildings were 20th-century concrete-and-stucco moderns that were nevertheless made beautiful by the human inhabitants. Italian cities are different: the buildings don’t need to be beautified, because they were built with artistic flourish. The average apartment building in Palermo was constructed in the 18th or 19th century (according to my estimate) in a distinctive Italian style, with styled columns, curved iron rails on the balconies, and marble busts and statues sticking out of the corners. Any one of these buildings would be a marvel in most cities, but in Italy they are commonplace. Also, there seems to be a beautiful Renaissance-style church on every block, with a brilliant design and examples of superb craftmanship that lose their power when surrounded by other equally brilliant buildings. 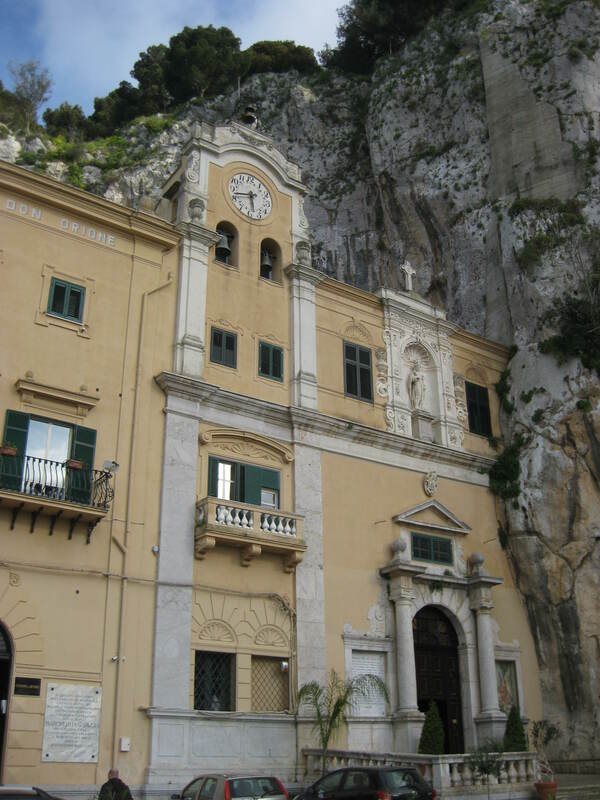 A 17th-century church in Palermo. 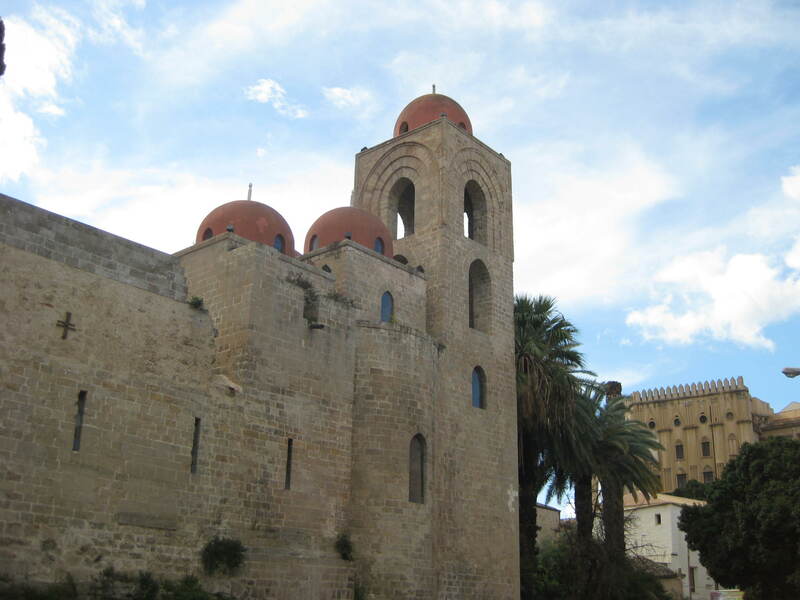 Due to centuries of Muslim occupation, many of the oldest buildings in Palermo have a unique hybrid style. 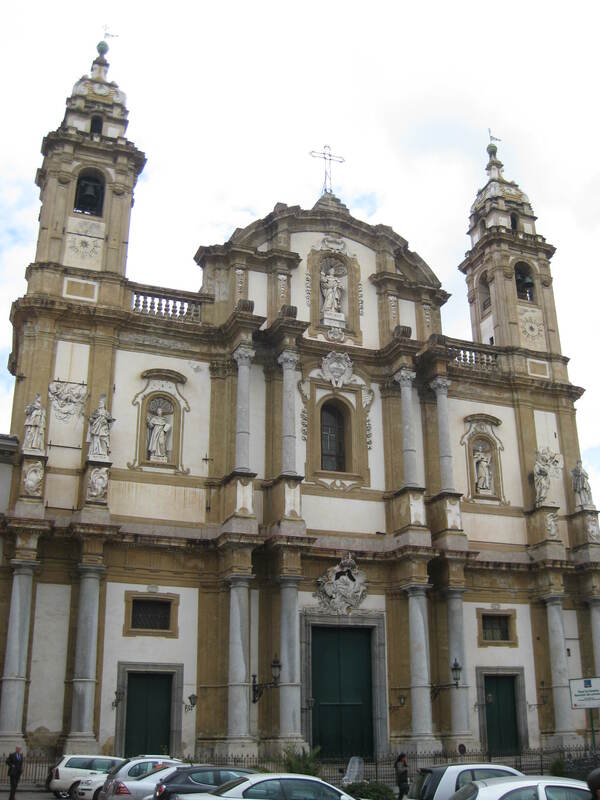 On Tuesday, Bryanna and I visited one of these, the San Cataldo church. Built in the 12th century as a monastery, the church is so humble that it’s hard to find among the larger buildings next to it. I had trouble taking a good picture because most of the front is blocked by a tree. The red Islamic-style domes are striking, however, and there are beautiful Byzantine mosaics and a serene garden inside. 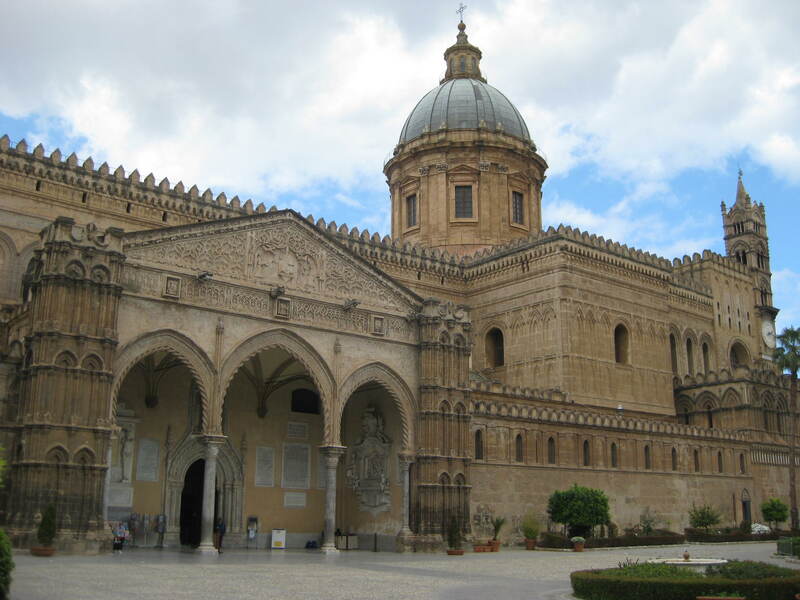 Near the Chiesa di San Cataldo is the Pallazzo dei Normanni, a.k.a Norman Palace, which was built during Sicily’s occupation by the Normans. On one side of the palace are statues that seem to depict the vanquished former Muslim rulers of the city. A few blocks away from the palace, there is a cathedral built by the Norman rulers that is also in the Arab-Norman-Byzantine style. Unlike the other churchs we visited in Palermo, it is modestly decorated inside, with very little gold and very few paintings and mosaics. Whether this was an artistic decision or an economic measure, I don’t know, but in my opinion it gave the church a more spiritual air. 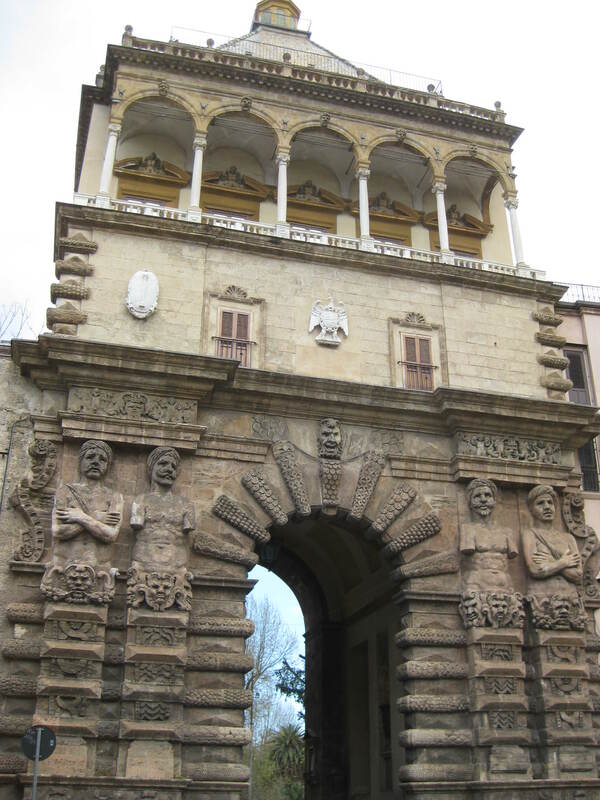 Part of the Pallazzo dei Normanni. On Wednesday, Bryanna and I went to the Capuchin Catacombs of Palermo. Walking through the hallways with corpses of citizens of Palermo hanging from the walls, I wished I had read more about the site beforehand. Why would anyone want to be put in such a position after dying – standing with their jaw agape, looking as if their skeleton could collapse at any moment, with flakes of skin curling off their skull? It seemed to be the opposite of the normal human desire to be in a position of rest after the end of life. According to Wikipedia, the catacombs began as a tradition of mummifying monks, and later became a status symbol among the people of Palermo. I wonder if it would have been such a status symbol if they knew that their skeletons would be gawked at by tourists a hundred years later. That afternoon, we took a bus to the top of the Monte Pellegrino, where the sunshine and the excellent view of Palermo helped us shake off the morbid vibes we got from the catacombs. At the top of the mountain, there was a church built into a cave. The church at the top of Monte Pellegrino. People spoke less English in Palermo than in Greece, which I liked, strangely. I studied a little Italian about six years ago, so I could communicate simple ideas like “when does bus 101 arrive” and “how much for a beer?” It felt nice when an Italian word that I wasn’t even aware I knew came out of my mouth. The lack of English speakers in Palermo might be due to the fact that there aren’t many tourists there. We saw very few fellow tourists during our time in Palermo, especially outside of the hostel. Indeed, there were only a few hostels to choose from, compared to dozens in cities like Athens, Istanbul and Rome. If you’re looking for an Italian city that has not yet been made into a tourist theme park, Palermo is a good place to go.